If you only read what is coming out of congressional offices and only watched Fox News, you’d certainly think that local heroes Mike and Chantelle Sackett from Priest Lake are about to go to the Supreme Court and bring down the whole EPA. Finally, they say, the overreaching federal agency and their wetland tyranny will be shut down once and for all. Instead, at most, it’ll clarify a difficult procedural point in the Clean Water Act. Indeed, the Sacketts could win their Supreme Court case and still end up with wetland enforcement on their property by EPA. It’s just a matter of how that enforcement gets done. The Sacketts have challenged a structural legal problem in enforcement of the Clean Water Act. 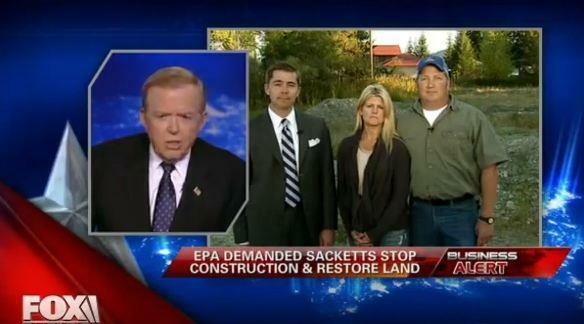 Fundamentally, the EPA says there are wetlands on the property, the Sacketts say there are no wetlands. The question at the Supreme Court is essentially how that dispute gets resolved. The Sacketts say they should get to affirmatively go to court to immediately decide it. The EPA, and the lower courts, say the actual language in the law does not allow such a court challenge. Instead the Clean Water Act suggests that Sacketts can get a permit or they can defend against an enforcement action in a court. It is a major case because a wide range of environmental and other federal statutes are structured similarly. An imperfect but illustrative analogy is that a speeder is pulled over for going 70 mph in a 55 mph zone. The speeder points to a sign, directly in front of the cop, that says “Speed Limit 70.” The cop issues the ticket anyway. The traditional remedy is that you appeal the ticket in Court. The Sacketts, however, are essentially arguing that they should get to go to court to dispute the facts before the cop even issues the ticket. Instead, in this case, we have an ideologically driven lawsuit by the ideologically driven Pacific Legal Foundation which may or may not decide a fine point of Clean Water Act enforcement procedure. So, don’t believe the hype. To be completely clear, what is not in dispute in the Supreme Court case is: wetlands are regulated; EPA and the Corps of Engineers have regulatory jurisdiction and authority; if you fill wetlands you need a permit; and if you fill wetlands without a permit you are violating the law and you are subject to enforcement. When you get your day in court is the only issue to be determined. I do believe the Hype! Your analogy about the speeder is interesting. You comment about the Sacketts arguing that they should get to go to court to dispute the facts before getting issued the ticket, when in reality, the nine most powerful justices in the United States of America (Supreme Court, Prominent Judges of all things, should know) agreed to hear this case against the EPA. Obviously, the Sacketts will be getting their day in court, and maybe it’s time for these overreaching federal agencies to change the way they behave. The Sacketts are Patriots in my book! I don’t think you know all the facts of this case, and I admit I do not know all the details either. What I do know, is that the owners of the parcel in question pulled their building permits from the proper agencies. Then the EPA shows up on site and basically deems it a wetland without showing any proof or documentation. The EPA then threatens the owners with jail time and exorbitant fines that would make Bill Gates cringe, if they don’t spend thousands of dollars and do exactly as they say and return the land to it’s natural state, fence it and hold it for 3 years. All the Sacketts have ever asked for is their day in court and that has been as close to an impossible task as getting Obama to do what he promised when he was giving campaign speeches 4 years ago. Your blog makes it sound like this is a landowner run amok, but isn’t it ironic that 12 or 13 states jumped in on the case and filed briefs with the Supreme Court in last couple of weeks backing the Sackett’s suit against the EPA. I believe your analogy is a little off base or as you say imperfect. Here is a more accurate one: a law abiding citizen is driving 55 on the interstate but there are no posted speed limit signs anywhere, and he gets pulled over. The officer then declares on the spot that he was speeding, but there will be no day in court and the officer establishes a fine of say $37,000 per day and here is the kicker: the owner will pull the motor out of the car for 3 years, lock in a garage and not use it. I believe you are correct in stating that this issue is ideologically driven- by the fore fathers of our country who drafted the Constitution. Right or wrong if the Sackett’s parcel is in a wetland or if it is not, there still is no due process to contend a finding of the EPA and this arm of the Federal Government is able to strong arm and intimidate hard working citizens who just want a small piece of the American dream. So hopefully when this case is resolved, it will have some clarity on how wetlands are regulated and changes will be made to the policies and procedures of the EPA, so when an honest hard working American citizen goes and pulls a building permit and begins work on their piece of the American dream ol’ Uncles Sam’s cousin- Guido aka. the EPA doesn’t show up and wreak havoc on their lives leaving the property owner without a leg to stand on. I believe that the majority of what the EPA does is good for the country, but there are issues that need to be dealt with so citizens in this country don’t feel like they live in Nazi Germany. The Sacketts are not local heroes- they are national heroes for standing up to a monster of an out of control government agency. I think I’ll be making a donation to the Pacific Legal Foundation. You sort of demonstrate my point. There IS an interesting question of when someone can get into court to challenge a wetlands decision. The Supreme Court will decide it. Comparing the EPA actions to Nazi Germany is a little beyond what this case is about. Even if we knew nothing at all about this case, there are only two possible things that can be true: either 1) there were wetlands on the Sackett property, or 2) there were not wetlands on the Sackett property. This case is ONLY about how and when a court makes that decision. If there were NOT wetlands on the property, then EPA can’t prove their enforcement case, and so there is no circumstance where a court can order the draconian Bill Gates sized fines or jail time. If there WERE wetlands on the property, then the Sacketts have violated the law by filling them and they should be subject to enforcement. Nothing about this Supreme Court case changes those fundamentals. jurisdictional, but as per the Kennedy opinion that is not the case. treated as if they are planning to put up a shopping mall on swampland ? not going to seriously impact wetland function no matter what. This whole case really makes the EPA look bad. You’re correct that we’re talking about “jurisdictional” wetlands, but out point is that we’re not making assumptions about it one way or another at this point. Whether the wetlands are under EPA jurisdiction or not requires some factual determinations that haven’t been made. In this case, EPA obviously thinks there’s jurisdiction. The Sacketts don’t. As for whether the Sackett’s home on (an alleged) wetland will seriously impact wetland function or not, well, maybe and maybe not. We’ll see. We DO know, however, that with the development pressures coming to Priest Lake, it won’t take long before the dozens and dozens of “single homes in platted subdivisions” start to take a serious toll on the relatively pristine Lake. In our view, giving a blind eye to violations of the law would make the EPA look just worse. I think you are making an apples and oranges argument. First – there are REAL differences between the things that can occur with someone driving on the road versus the EPA action. The biggest problem is you are talking about rights versus privileges. I have the privilege of driving on the road. Land ownership is a right. BIG difference under the law. Example – I can’t operate a motor vehicle unless I have a drivers license. I can earn the privilege of a drivers license by jumping through state approved hoops. Amongst these, I forfeit the right to not be subject to a blood alcohol test if I want to keep the license if I’m pulled for a DUI. When I purchase a property – I am granted certain Land ownership rights. I can not be denied these rights without due process of law – something guaranteed by the Constitution. The government is FORBIDDEN by the Constitution from denying me these rights without that due process. The EPA in it’s actions can NOT exceed Constitutional limits. Now – if the EPA is anything like FCC – to which I have some familiarity, it is going to issue Notices of Violation first (They apparently got that…), then it is going to issue a Notice of Apparent Liability (or the equivalent) if it determines you haven’t reacted appropriately in the agencies opinion to the Notice of Violation. The NAL is a bill – make no mistake about that… However, there is going to be an Administrative Law Judge or the equivalent that you would have to appeal the NAL too. Your real point if I understand it is that they chose not to avail themselves of this process because of the cost. There is a fundamental problem with this whole procedure though in that we’re dealing with rights versus privileges again. The FCC analogy I’m using applies to something that involves privileges. If I’m an FCC licensee – it is exactly like your original straw-man involving the driver. However, I’ve already dealt with that – owning property is a Constitutionally guaranteed right. The EPA’s enforcement structure maybe should be declared completely Unconstitutional! I don’t want to defend the analogy too much — I was only trying to illustrate the procedural nature of the case. Your FCC analogy seems like it might be more apt, but I’m not familiar with it. As for the rights vs. privileges distinction, I agree that the Constitution protects against takings without just compensation. The procedural complexities in this case notwithstanding, there is likely to be no taking here — the option to apply for a permit absolutely still exists.